For improved traction on slick, slippery surfaces, Servus XTP 15" PVC Chemical-Resistant Soft Toe Men's Work Boots have a specially-designed open pattern outsole that self-cleans liquid and debris from underfoot to help prevent slips and falls. Ideal for workers in food processing or on oil rigs, these men's work boots feature proprietary formulations to resist degradation from many harsh chemicals. Injection-molded, Triple Density Technology (TDT) offers seamless, waterproof wear that keeps feet dry and protected. 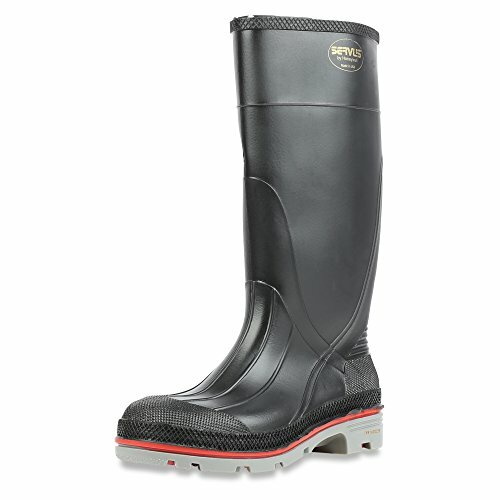 The FOOT FORM contoured insole and wide steel shanks in these rubber boots provide arch and heel support for comfort during long days on your feet.